Definition: A variety of egg pasta spaghetti which has a square cross section of about 2-3 cms. Spaghetti Alla Chitarra is a classic dish from the Italian region of Abruzzo. This pasta is long and uniquely square-shaped and named after the guitar-like tool used to make it. 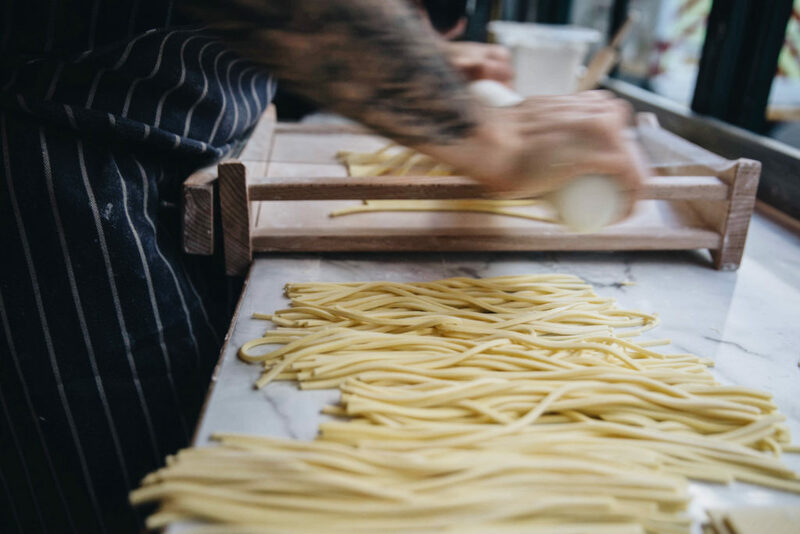 The making of Spaghetti Alla Chitarra dates back to the Middle Ages so must be a winner to achieve that longevity. Unlike other fresh pasta variations that unveil a silky smooth texture when cooked (notably, Fazzoletti that we reviewed last month), this is best served with a bite or ‘al dente’. The reference to the guitar? Chitarra literally translates to ‘guitar’ in Italian. The said tool used to create this type of spaghetti – a stringed pasta cutter – resembles that of a guitar and hence how it rounded up with it’s name. 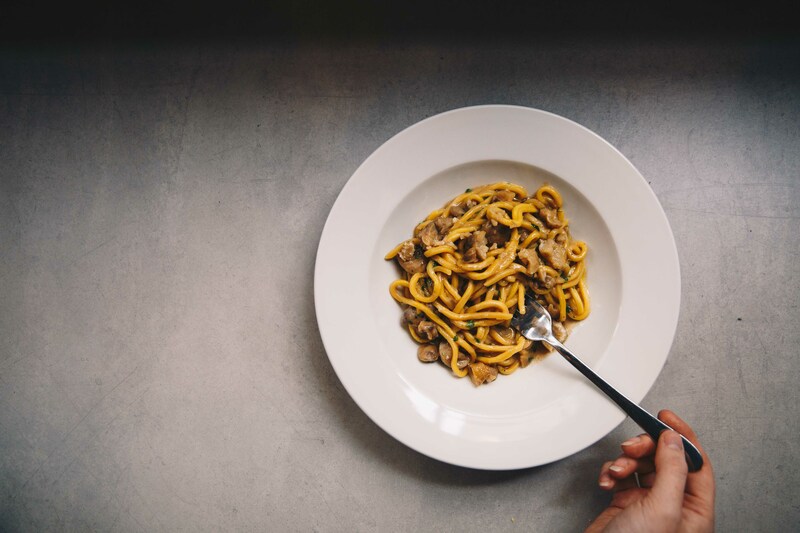 Forget roasting your chestnuts this Christmas – instead, try this recipe that’s a perfect combination with Spaghetti Alla Chitarra (or other spaghetti variations that might be hiding in your store cupboard)…. 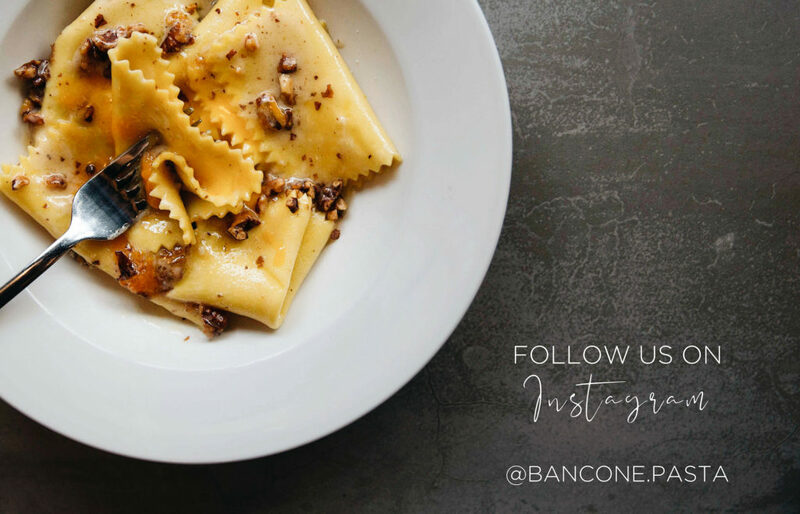 Use #BanconePastaSeries to show us how you get on! Gently heat two tablespoons of olive oil in a large, heavy-based pot, then add the shallots and cook, stirring regularly, until softened but not coloured. Add a splash of wine, cook until the alcohol evaporates, then stir in the chestnuts – reserve three or four to garnish. Pour in enough vegetable stock just to cover, then leave to simmer for 20 minutes, until the chestnuts start to break down and the liquid has reduced by a third. Tip the sauce into a food processor or blender, blitz to a smooth, creamy paste and season to taste. Finely chop the chervil, reserving a few sprigs for garnish. Bring a large pot of salted water to a boil and cook the pasta until al dente. Meanwhile, reheat the chestnut paste on a low heat, taking care it doesn’t boil or catch. Use tongs to lift the cooked pasta from the water and combine with the chestnut sauce, then toss with the chopped chervil and a small splash of wine. Add a tablespoon or two of oil and a small ladle of the cooking water, and toss again until the sauce emulsifies and coats the pasta. Check for seasoning, garnish with the reserved chestnuts and chervil. Serve immediately.